With Telegram Passport you can easily sign up for websites and services that require identity verification. Your information, personal data, and documents are protected by end-to-end encryption. Nobody, including Telegram, can access them without your permission. You can visit our FAQ to learn more. Please enter your password to access your personal data. Please create a password to secure your personal data with end-to-end encryption. This password will also be required whenever you log in to Telegram on a new device. Please enter your Telegram Password to decrypt your data. You can add your phone number, email address, identity document or residential address. **%1$s** requests access to your personal data to sign you up for their services. You are sending your documents directly to %1$s and allowing their @%2$s to send you messages. The document must contain your photograph, first and last name, date of birth, document number, country of issue, and expiry date. To confirm your address, please upload a scan or photo of the selected document (all pages). Please use latin characters only. Scan your passport or identity card with machine-readable zone to fill personal details automatically. Upload a scan of your utility bill. Upload a scan of your bank statement. Upload a scan of your tenancy agreement. 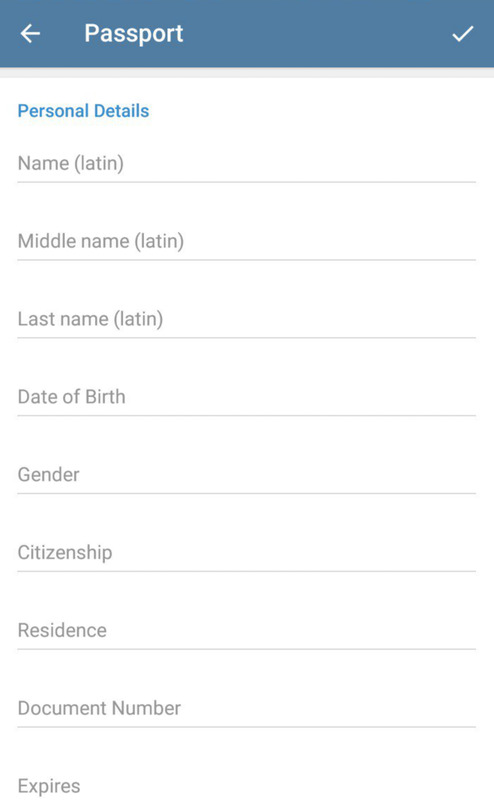 Upload a scan of your passport registration page. Upload a scan of your temporary registration. Use the same email as on Telegram. Note: You will receive a confirmation code on the email address you provide. Please enter the confirmation code we've just sent to %1$s. Please enter the confirmation code we’ve just sent to %1$s. Use the same phone number as on Telegram. Note: You will receive a confirmation code on the phone number you provide. Please log in to your Telegram account to use Telegram Passport. You need Telegram to log in to **%s**. Would you like to install it now? Are you sure you want to delete this selfie? Do you want to delete this selfie? Are you sure you want to delete this scan? Do you want to delete this scan? Are you sure you want to discard all information you've entered? Are you sure you want to discard all information you’ve entered? Do you want to delete this document? Are you sure you want to delete personal details? Are you sure you want to delete address details? Do you want to delete address details? Are you sure you want to delete your Telegram Passport? Are you sure you want to disable your password? Warning! All data saved in your Telegram Passport will be lost! You can't upload more than %1$s. You can’t upload more than %1$s. You can only upload image files. Upload scans of a certified English translation of your passport. Upload scans of a certified English translation of your internal passport. Upload scans of a certified English translation of your identity card. Upload scans of a certified English translation of your driver licence. Upload scans of a certified English translation of your driver's license. Upload scans of a certified English translation of your utility bill. Upload scans of a certified English translation of your bank statement. Upload scans of a certified English translation of your tenancy agreement. Upload scans of a certified English translation of your passport registration page. Upload scans of a certified English translation of your temporary registration. Upload scans of a certified English translation of the selected document. Sorry, your Telegram app is out of date and can't handle this request. Please update Telegram. Sorry, your Telegram app is out of date and can’t handle this request. Please update Telegram. Your name in the language of your country of residence (%1$s). You can visit our *FAQ* to learn more.